Some of the huskers waiting to compete in their classes took time for a group picture. 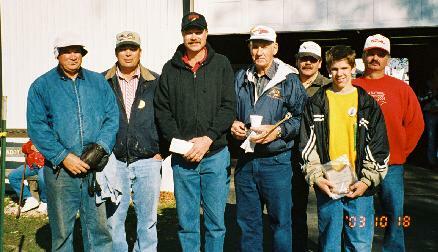 Mitchel Burns-MO, Paul VanArsdale-IL, Frank Hennenfent-IL, John VanLiere-SD, Rob Roberts-MO, Seth Roberts-MO, Fred Fedeler-SD. 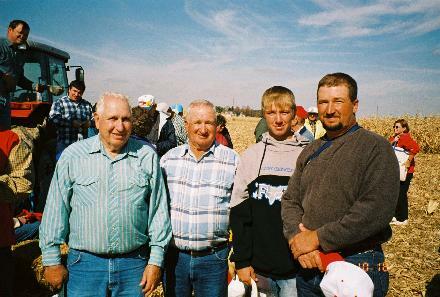 Three generations of the Guthrie family form Nebraska were husking contestants . ( Left to Right ) Jack, 9th place in the Men's Senior (50 and up ) class. Wayne, 1st place in the Men' Open class. Riley, 1st place in the Men's under 21 class. Jerry, 2nd place in the Men's ( 21 - 49 ) class.